In the sports world today, women are viewed as not living up to the standards that men do. What they are payed shows the amount of disrespect they are given, even though they do the same thing men do and work just as hard as them. The income gap between women and men in sports has been well publicized. If you were to compare the average salary of every sport between males and females you would see how ridiculously gapped they are. In the world women only earn 77% of what their male counterparts earn. But in sports alone women only earn a fraction of what the men do in the same profession. If you take a look each sport you would see the big difference. In professional basketball the average salary of a NBA player is $4,500,000 and the average salary of a WNBA player is $72,00. The women are only earning 1.6% of the men’s salary for doing the same thing! Now many will say that the reason for the big gap is because of how much revenue the NBA produces. But I think that the reason for that is because the WNBA is not given the opportunity to produce as much revenue. On television you will rarely see any WNBA games on while the NBA has their own channel. Another heated topic about this gender pay gap is between the U.S. Women’s National Soccer Team and the Men’s National Soccer Team. Women on the national team only make 40% of the men do. 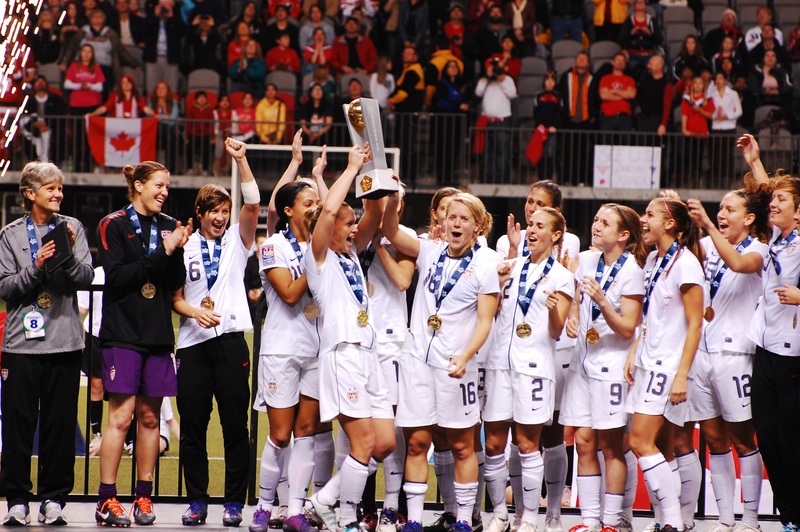 The USWNT although has had a lot more success for their team than the men have. Winning three Fifa World Cups, four Olympic women’s gold medals, seven CONCACAF Gold Cup wins, and ten Algarve Cups. While the men’s national team has not won a world cup and the only thing they have won is the CONCACAF Gold Cup 3 times in their history. In the case against the men’s national team for equal pay, the women are represented by Jeffrey Kessler. He has a lot to say about this situation and how it is the strongest case in sports about the gender pay gap. The women’s national soccer team has had so much more success than the men’s soccer team yet they are still not paid what they deserve. This not only occurs in sports but jobs around the country. It is the 21st century and women are still considered to be at a lower level than men. For doing the same job and getting the same results as a man does, and they still gets paid less, that is a problem.